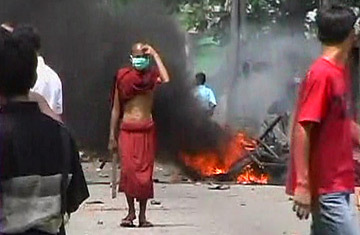 A monk runs as tear gas fills the air in downtown Yangon during a police crackdown on protestors, September 2007. With foreign journalists locked out of the country by Burma's military government, this dispatch was written by TIME staff based on eyewitness reports. The battle for Shwedagon began in ferocious noonday heat. The authorities had locked the gates of the pagoda, Rangoon's most famous landmark, by mid-morning to prevent the monks who had led the weeklong demonstrations against Burma's military rulers from gathering. Police and soldiers guarded the entrances. The eastern gate of Shwedagon is where thousands of monks would otherwise exit to start their march into downtown Rangoon. But today, hundreds of soldiers and riot police blocked their way. By 12:30 p.m., hundreds of monks, students, and other Rangoon residents approached the police, stood in the road and began to pray. Then the soldiers and police began pulling monks from the crowd, targeting the leaders, striking both monks and ordinary people with canes. Several smoke bombs exploded and the riot police charged. The monks and others fought back with sticks and rocks. Many others ran, perhaps four or five of them bleeding from minor head wounds. A car was set alight  by the soldiers, some protesters claimed  and then there was the unmistakable crack of live ammunition: the soldiers were shooting into the air. "They are not Buddhists," cried one student, who clutched half a brick in his hand, running from the smoke. "They are not humans. We were praying peacefully and they beat us. They beat the monks, even the old ones." An 80-year-old monk stood with the student, bleeding from a baton gash on his shaven head. However, after this confrontation, the monks regrouped and surged forward again. Shops along the road were shuttered, but people threw down water bottles from their balconies to aide the protesters. Minutes later, the arc of a tear-gas canister looped through the air toward the pagoda's east entrance. The air was full of dense black clouds from a burning car and motorbike. Running monks retreated through the smoke, many armed with clubs of scavenged wood, one armed with a riot shield snatched from the police. They were shaking and incandescent with rage. "The United Nations must know about this!" cried one. "They beat the nuns too," cried another. Suddenly there was what sounded like an enormous explosion: a clap of thunder. Monks and people cheer and applaud. A sign of cosmic solidarity. One monk raised his hands to the heavens and shouted, "The rain is coming! The soldiers will be struck by lightning!" But, a woman retorted, "Lightning is not enough. They deserve more." A cheer goes up with each subsequent clap of thunder. A pause came upon the battle. The monks regrouped at a nearby monastery to march downtown. But first came a chilling display of the people's anger  and the monks' moral influence. A man on a motorcycle rode up. Motorcycles have been banned in Rangoon for years, ever since  the story goes  the paranoid generals fear being shot by assassins riding one of them. Most people on motorcycles are therefore assumed to be spies.